This article is about the general language. For modern vernaculars, see varieties of Arabic. For the literary standard, see Modern Standard Arabic. For the historical language family, see Classification of Arabic languages. For the separate South Semitic language group, see Modern South Arabian languages. Arabic (Arabic: العَرَبِيَّة‎ al-ʻarabiyyah [ʔal.ʕa.ra.ˈbij.jah] ( listen), or عَرَبِيّ‎ ʻarabī [ˈʕa.ra.biː] ( listen) or [ʕa.ra.ˈbijj]) is usually classified as a Central Semitic language, and linguists widely agree that the language first emerged in the 1st to 4th centuries CE.. It is now the lingua franca of the Arab world. It is named after the Arabs, a term initially used to describe peoples living in the area bounded by Mesopotamia in the east and the Anti-Lebanon mountains in the west, in northwestern Arabia, and in the Sinai Peninsula. Arabic is classified as a macrolanguage comprising 30 modern varieties, including its standard form, Modern Standard Arabic, which is derived from Classical Arabic. As the modern written language, Modern Standard Arabic is widely taught in schools and universities, and is used to varying degrees in workplaces, government, and the media. The two formal varieties are grouped together as Literary Arabic (fuṣḥā), which is the official language of 26 states, and the liturgical language of the religion of Islam, since the Quran and Hadith were written in Arabic. Modern Standard Arabic largely follows the grammatical standards of Classical Arabic, and uses much of the same vocabulary. However, it has discarded some grammatical constructions and vocabulary that no longer have any counterpart in the spoken varieties, and has adopted certain new constructions and vocabulary from the spoken varieties. Much of the new vocabulary is used to denote concepts that have arisen in the post-classical era, especially in modern times. Due to its grounding in Classical Arabic, Modern Standard Arabic is removed over a millennium from everyday speech, which is construed as a multitude of dialects of this language. These dialects and Modern Standard Arabic are described by some scholars as not mutually comprehensible. The former are usually acquired in families, while the latter is taught in formal education settings. However, there have been studies reporting some degree of comprehension of stories told in the standard variety among preschool-aged children. The relation between Modern Standard Arabic and these dialects is sometimes compared to that of Latin and vernaculars (or today’s French, Czech or German) in medieval and early modern Europe. This view though does not take into account the widespread use of Modern Standard Arabic as a medium of audiovisual communication in today’s mass media—a function Latin has never performed. During the Middle Ages, Literary Arabic was a major vehicle of culture in Europe, especially in science, mathematics and philosophy. As a result, many European languages have also borrowed many words from it. Arabic influence, mainly in vocabulary, is seen in European languages, mainly Spanish and to a lesser extent Portuguese, and Catalan, owing to both the proximity of Christian European and Muslim Arab civilizations and 800 years of Arabic culture and language in the Iberian Peninsula, referred to in Arabic as al-Andalus. Sicilian has about 500 Arabic words as result of Sicily being progressively conquered by Arabs from North Africa, from the mid-9th to mid-10th centuries. Many of these words relate to agriculture and related activities. [full citation needed] The Balkan languages, including Greek and Bulgarian, have also acquired a significant number of Arabic words through contact with Ottoman Turkish. Arabic has influenced many languages around the globe throughout its history. Some of the most influenced languages are Persian, Turkish, Spanish, Urdu, Kashmiri, Kurdish, Bosnian, Kazakh, Bengali, Hindi, Malay, Maldivian, Indonesian, Pashto, Punjabi, Tagalog, Assamese, Sindhi, Oriya, and Hausa, and some languages in parts of Africa. Conversely, Arabic has borrowed words from other languages, including Greek and Persian in medieval times, and contemporary European languages such as English and French in modern times. Classical Arabic is the liturgical language of 1.8 billion Muslims, and Modern Standard Arabic is one of six official languages of the United Nations. All varieties of Arabic combined are spoken by perhaps as many as 422 million speakers (native and non-native) in the Arab world, making it the fifth most spoken language in the world. Arabic is written with the Arabic alphabet, which is an abjad script and is written from right to left, although the spoken varieties are sometimes written in ASCII Latin from left to right with no standardized orthography. Arabic is usually, but not universally, classified as a Central Semitic language. It is related to languages in other subgroups of the Semitic language group (Northwest Semitic, South Semitic, East Semitic, West Semitic), such as Aramaic, Syriac, Hebrew, Ugaritic, Phoenician, Canaanite, Amorite, Ammonite, Eblaite, epigraphic Ancient North Arabian, epigrahic Ancient South Arabian, Ethiopic, Modern South Arabian, and numerous other dead and modern languages. Linguists still differ as to the best classification of Semitic language sub-groups. The conversion of the suffix-conjugated stative formation (jalas-) into a past tense. The conversion of the prefix-conjugated preterite-tense formation (yajlis-) into a present tense. The elimination of other prefix-conjugated mood/aspect forms (e.g., a present tense formed by doubling the middle root, a perfect formed by infixing a /t/ after the first root consonant, probably a jussive formed by a stress shift) in favor of new moods formed by endings attached to the prefix-conjugation forms (e.g., -u for indicative, -a for subjunctive, no ending for jussive, -an or -anna for energetic). The development of an internal passive. Arabia boasted a wide variety of Semitic languages in antiquity. In the southwest, various Central Semitic languages both belonging to and outside of the Ancient South Arabian family (e.g. Southern Thamudic) were spoken. It is also believed that the ancestors of the Modern South Arabian languages (non-Central Semitic languages) were also spoken in southern Arabia at this time. To the north, in the oases of northern Hejaz, Dadanitic and Taymanitic held some prestige as inscriptional languages. In Najd and parts of western Arabia, a language known to scholars as Thamudic C is attested. In eastern Arabia, inscriptions in a script derived from ASA attest to a language known as Hasaitic. Finally, on the northwestern frontier of Arabia, various languages known to scholars as Thamudic B, Thamudic D, Safaitic, and Hismaic are attested. The last two share important isoglosses with later forms of Arabic, leading scholars to theorize that Safaitic and Hismaic are in fact early forms of Arabic and that they should be considered Old Arabic. In late pre-Islamic times, a transdialectal and transcommunal variety of Arabic emerged in the Hejaz which continued living its parallel life after literary Arabic had been institutionally standardized in the 2nd and 3rd century of the Hijra, most strongly in Judeo-Christian texts, keeping alive ancient features eliminated from the “learned” tradition (Classical Arabic). This variety and both its classicizing and “lay” iterations have been termed Middle Arabic in the past, but they are thought to continue an Old Higazi register. It is clear that the orthography of the Qur’an was not developed for the standardized form of Classical Arabic; rather, it shows the attempt on the part of writers to record an archaic form of Old Higazi. In the late 6th century AD, a relatively uniform intertribal “poetic koine” distinct from the spoken vernaculars developed based on the Bedouin dialects of Najd, probably in connection with the court of al-Ḥīra. During the first Islamic century, the majority of Arabic poets and Arabic-writing persons spoke Arabic as their mother tongue. Their texts, although mainly preserved in far later manuscripts, contain traces of non-standardized Classical Arabic elements in morphology and syntax. The standardization of Classical Arabic reached completion around the end of the 8th century. The first comprehensive description of the ʿarabiyya “Arabic”, Sībawayhi’s al–Kitāb, is based first of all upon a corpus of poetic texts, in addition to Qur’an usage and Bedouin informants whom he considered to be reliable speakers of the ʿarabiyya. By the 8th century, knowledge of Classical Arabic had become an essential prerequisite for rising into the higher classes throughout the Islamic world. Charles Ferguson’s koine theory (Ferguson 1959) claims that the modern Arabic dialects collectively descend from a single military koine that sprang up during the Islamic conquests; this view has been challenged in recent times. Ahmad al-Jallad proposes that there were at least two considerably distinct types of Arabic on the eve of the conquests: Northern and Central (Al-Jallad 2009). The modern dialects emerged from a new contact situation produced following the conquests. Instead of the emergence of a single or multiple koines, the dialects contain several sedimentary layers of borrowed and areal features, which they absorbed at different points in their linguistic histories. According to Veersteegh and Bickerton, colloquial Arabic dialects arose from pidginized Arabic formed from contact between Arabs and conquered peoples. Pidginization and subsequent creolization among Arabs and arabized peoples could explain relative morphological and phonological simplicity of vernacular Arabic compared to Classical and MSA. Arabic usually designates one of three main variants: Classical Arabic, Modern Standard Arabic and colloquial or dialectal Arabic. Classical Arabic is the language found in the Quran, used from the period of Pre-Islamic Arabia to that of the Abbasid Caliphate. Theoretically, Classical Arabic is considered normative, according to the syntactic and grammatical norms laid down by classical grammarians (such as Al-Farāhīdī ) and the vocabulary defined in classical dictionaries (such as the Lisān al-ʻArab). In practice, however, modern authors almost never write in pure Classical Arabic, instead using a literary language with its own grammatical norms and vocabulary, commonly known as Modern Standard Arabic (MSA). MSA is the variety used in most current, printed Arabic publications, spoken by some of the Arabic media across North Africa and the Middle East, and understood by most educated Arabic speakers. “Literary Arabic” and “Standard Arabic” (فُصْحَى‎ fuṣḥá) are less strictly defined terms that may refer to Modern Standard Arabic or Classical Arabic. Certain grammatical constructions of CA that have no counterpart in any modern dialect (e.g., the energetic mood) are almost never used in Modern Standard Arabic. No modern spoken variety of Arabic has case distinctions. As a result, MSA is generally composed without case distinctions in mind, and the proper cases are added after the fact, when necessary. Because most case endings are noted using final short vowels, which are normally left unwritten in the Arabic script, it is unnecessary to determine the proper case of most words. The practical result of this is that MSA, like English and Standard Chinese, is written in a strongly determined word order and alternative orders that were used in CA for emphasis are rare. In addition, because of the lack of case marking in the spoken varieties, most speakers cannot consistently use the correct endings in extemporaneous speech. As a result, spoken MSA tends to drop or regularize the endings except when reading from a prepared text. The numeral system in CA is complex and heavily tied in with the case system. This system is never used in MSA, even in the most formal of circumstances; instead, a significantly simplified system is used, approximating the system of the conservative spoken varieties. MSA uses much Classical vocabulary (e.g., dhahaba ‘to go’) that is not present in the spoken varieties, but deletes Classical words that sound obsolete in MSA. In addition, MSA has borrowed or coined a large number of terms for concepts that did not exist in Quranic times, and MSA continues to evolve. Some words have been borrowed from other languages—notice that transliteration mainly indicates spelling and not real pronunciation (e.g., فِلْم‎ film ‘film’ or ديمقراطية‎ dīmuqrāṭiyyah ‘democracy’). However, the current preference is to avoid direct borrowings, preferring to either use loan translations (e.g., فرع‎ farʻ ‘branch’, also used for the branch of a company or organization; جناح‎ janāḥ ‘wing’, is also used for the wing of an airplane, building, air force, etc. ), or to coin new words using forms within existing roots (استماتة‎ istimātah ‘apoptosis‘, using the root موت‎ m/w/t ‘death’ put into the Xth form, or جامعة‎ jāmiʻah ‘university’, based on جمع‎ jamaʻa ‘to gather, unite’; جمهورية‎ jumhūriyyah ‘republic’, based on جمهور‎ jumhūr ‘multitude’). An earlier tendency was to redefine an older word although this has fallen into disuse (e.g., هاتف‎ hātif ‘telephone’ < ‘invisible caller (in Sufism)’; جريدة‎ jarīdah ‘newspaper’ < ‘palm-leaf stalk’). Colloquial or dialectal Arabic refers to the many national or regional varieties which constitute the everyday spoken language and evolved from Classical Arabic. Colloquial Arabic has many regional variants; geographically distant varieties usually differ enough to be mutually unintelligible, and some linguists consider them distinct languages. The varieties are typically unwritten. They are often used in informal spoken media, such as soap operas and talk shows, as well as occasionally in certain forms of written media such as poetry and printed advertising. The only variety of modern Arabic to have acquired official language status is Maltese, which is spoken in (predominantly Catholic) Malta and written with the Latin script. It is descended from Classical Arabic through Siculo-Arabic, but is not mutually intelligible with any other variety of Arabic. Most linguists list it as a separate language rather than as a dialect of Arabic. Even during Muhammad’s lifetime, there were dialects of spoken Arabic. Muhammad spoke in the dialect of Mecca, in the western Arabian peninsula, and it was in this dialect that the Quran was written down. However, the dialects of the eastern Arabian peninsula were considered the most prestigious at the time, so the language of the Quran was ultimately converted to follow the eastern phonology. It is this phonology that underlies the modern pronunciation of Classical Arabic. The phonological differences between these two dialects account for some of the complexities of Arabic writing, most notably the writing of the glottal stop or hamzah (which was preserved in the eastern dialects but lost in western speech) and the use of alif maqṣūrah (representing a sound preserved in the western dialects but merged with ā in eastern speech). The sociolinguistic situation of Arabic in modern times provides a prime example of the linguistic phenomenon of diglossia, which is the normal use of two separate varieties of the same language, usually in different social situations. In the case of Arabic, educated Arabs of any nationality can be assumed to speak both their school-taught Standard Arabic as well as their native, mutually unintelligible “dialects”; these dialects linguistically constitute separate languages which may have dialects of their own. When educated Arabs of different dialects engage in conversation (for example, a Moroccan speaking with a Lebanese), many speakers code-switch back and forth between the dialectal and standard varieties of the language, sometimes even within the same sentence. Arabic speakers often improve their familiarity with other dialects via music or film. The issue of whether Arabic is one language or many languages is politically charged, in the same way it is for the varieties of Chinese, Hindi and Urdu, Serbian and Croatian, Scots and English, etc. In contrast to speakers of Hindi and Urdu who claim they cannot understand each other even when they can, speakers of the varieties of Arabic will claim they can all understand each other even when they cannot. The issue of diglossia between spoken and written language is a significant complicating factor: A single written form, significantly different from any of the spoken varieties learned natively, unites a number of sometimes divergent spoken forms. For political reasons, Arabs mostly assert that they all speak a single language, despite significant issues of mutual incomprehensibility among differing spoken versions. From a linguistic standpoint, it is often said that the various spoken varieties of Arabic differ among each other collectively about as much as the Romance languages. This is an apt comparison in a number of ways. The period of divergence from a single spoken form is similar—perhaps 1500 years for Arabic, 2000 years for the Romance languages. Also, while it is comprehensible to people from the Maghreb, a linguistically innovative variety such as Moroccan Arabic is essentially incomprehensible to Arabs from the Mashriq, much as French is incomprehensible to Spanish or Italian speakers but relatively easily learned by them. This suggests that the spoken varieties may linguistically be considered separate languages. The influence of Arabic has been most important in Islamic countries, because it is the language of the Islamic sacred book, the Quran. Arabic is also an important source of vocabulary for languages such as Amharic, Baluchi, Bengali, Berber, Bosnian, Chaldean, Chechen, Croatian, Dagestani, English, German, Gujarati, Hausa, Hindi, Kazakh, Kurdish, Kutchi, Kyrgyz, Malay (Malaysian and Indonesian), Pashto, Persian, Punjabi, Rohingya, Romance languages (French, Catalan, Italian, Portuguese, Sicilian, Spanish, etc.) Saraiki, Sindhi, Somali, Sylheti, Swahili, Tagalog, Tigrinya, Turkish, Turkmen, Urdu, Uyghur, Uzbek, Visayan and Wolof, as well as other languages in countries where these languages are spoken. The Education Minister of France has recently been emphasizing the learning and usage of Arabic in their schools. In addition, English has many Arabic loanwords, some directly, but most via other Mediterranean languages. Examples of such words include admiral, adobe, alchemy, alcohol, algebra, algorithm, alkaline, almanac, amber, arsenal, assassin, candy, carat, cipher, coffee, cotton, ghoul, hazard, jar, kismet, lemon, loofah, magazine, mattress, sherbet, sofa, sumac, tariff, and zenith. Other languages such as Maltese and Kinubi derive ultimately from Arabic, rather than merely borrowing vocabulary or grammatical rules. In languages not directly in contact with the Arab world, Arabic loanwords are often transferred indirectly via other languages rather than being transferred directly from Arabic. For example, most Arabic loanwords in Hindustani and Turkish entered through Persian though Persian is an Indo-Iranian language. Older Arabic loanwords in Hausa were borrowed from Kanuri. Arabic words also made their way into several West African languages as Islam spread across the Sahara. Variants of Arabic words such as كتاب‎ kitāb (“book”) have spread to the languages of African groups who had no direct contact with Arab traders. Since throughout the Islamic world, Arabic occupied a position similar to that of Latin in Europe, many of the Arabic concepts in the fields of science, philosophy, commerce, etc. were coined from Arabic roots by non-native Arabic speakers, notably by Aramaic and Persian translators, and then found their way into other languages. This process of using Arabic roots, especially in Kurdish and Persian, to translate foreign concepts continued through to the 18th and 19th centuries, when swaths of Arab-inhabited lands were under Ottoman rule. jazīrah (جزيرة), as in the well-known form الجزيرة “Al-Jazeera,” means “island” and has its origin in the Syriac ܓܙܝܪܗ gazīra. lāzaward (لازورد) is taken from Persian لاژورد lājvard, the name of a blue stone, lapis lazuli. This word was borrowed in several European languages to mean (light) blue – azure in English, azur in French and azul in Portuguese and Spanish. There have been many instances of national movements to convert Arabic script into Latin script or to Romanize the language. Currently, the only language derived from Classical Arabic to use Latin script is Maltese. The Beirut newspaper La Syrie pushed for the change from Arabic script to Latin letters in 1922. The major head of this movement was Louis Massignon, a French Orientalist, who brought his concern before the Arabic Language Academy in Damascus in 1928. Massignon’s attempt at Romanization failed as the Academy and population viewed the proposal as an attempt from the Western world to take over their country. Sa’id Afghani, a member of the Academy, mentioned that the movement to Romanize the script was a Zionist plan to dominate Lebanon. After the period of colonialism in Egypt, Egyptians were looking for a way to reclaim and re-emphasize Egyptian culture. As a result, some Egyptians pushed for an Egyptianization of the Arabic language in which the formal Arabic and the colloquial Arabic would be combined into one language and the Latin alphabet would be used. There was also the idea of finding a way to use Hieroglyphics instead of the Latin alphabet, but this was seen as too complicated to use. A scholar, Salama Musa agreed with the idea of applying a Latin alphabet to Arabic, as he believed that would allow Egypt to have a closer relationship with the West. He also believed that Latin script was key to the success of Egypt as it would allow for more advances in science and technology. This change in alphabet, he believed, would solve the problems inherent with Arabic, such as a lack of written vowels and difficulties writing foreign words that made it difficult for non-native speakers to learn. Ahmad Lutfi As Sayid and Muhammad Azmi, two Egyptian intellectuals, agreed with Musa and supported the push for Romanization. The idea that Romanization was necessary for modernization and growth in Egypt continued with Abd Al-Aziz Fahmi in 1944. He was the chairman for the Writing and Grammar Committee for the Arabic Language Academy of Cairo. However, this effort failed as the Egyptian people felt a strong cultural tie to the Arabic alphabet. In particular, the older Egyptian generations believed that the Arabic alphabet had strong connections to Arab values and history, due to the long history of the Arabic alphabet (Shrivtiel, 189) in Muslim societies. The Quran introduced a new way of writing to the world. People began studying and applying the unique styles they learned from the Quran to not only their own writing, but also their culture. Writers studied the unique structure and format of the Quran in order to identify and apply the figurative devices and their impact on the reader. The Quran inspired musicality in poetry through the internal rhythm of the verses. The arrangement of words, how certain sounds create harmony, and the agreement of rhymes create the sense of rhythm within each verse. At times, the chapters of the Quran only have the rhythm in common. The repetition in the Quran introduced the true power and impact repetition can have in poetry. The repetition of certain words and phrases made them appear more firm and explicit in the Quran. The Quran uses constant metaphors of blindness and deafness to imply unbelief. Metaphors were not a new concept to poetry, however the strength of extended metaphors was. The explicit imagery in the Quran inspired many poets to include and focus on the feature in their own work. The poet ibn al Mu’tazz wrote a book regarding the figures of speech inspired by his study of the Quran. Poets such as badr Shakir al sayyab expresses his political opinion in his work through imagery inspired by the forms of more harsher imagery used in the Quran. The Quran uses figurative devices in order to express the meaning in the most beautiful form possible. The study of the pauses in the Quran as well as other rhetoric allow it to be approached in a multiple ways. Although the Quran is known for its fluency and harmony, the structure can be best described as chaotic. The suras also known as chapters of the Quran are not placed in chronological order. The only constant in their structure is that the longest are placed first and shorter ones follow. The topics discussed in the chapter often have no relation to each other and only share their sense of rhyme. The Quran introduces to poetry the idea of abandoning order and scattering narratives throughout the text. Harmony is also present in the sound of the Quran. The elongations and accents present in the Quran create a harmonious flow within the writing. Unique sound of the Quran recited, due to the accents, create a deeper level of understanding through a deeper emotional connection. The Quran is written in a language that is simple and understandable by people. The simplicity of the writing inspired later poets to write in a more clear and clear-cut style. The words of the Quran, although unchanged, are to this day understandable and frequently used in both formal and informal Arabic. The simplicity of the language makes memorizing and reciting the Quran a slightly easier task. The writer al-Khattabi explains how culture is a required element to create a sense of art in work as well as understand it. He believes that fluency and harmony the Quran possess are not the only elements that make it beautiful and create a bond between the reader and the text. While a lot of poetry was deemed comparable to the Quran in that it is equal to or better than the composition of the Quran, a debate rose that such statements are not possible because humans are incapable of composing work comparable to the Quran. Because the structure of the Quran made it difficult for a clear timeline to be seen, Hadith were the main source of chronological order. The Hadith were passed down from generation to generation and this tradition became a large resource for understanding the context. Poetry after the Quran began possessing this element of tradition by including ambiguity and background information to be required to understand the meaning. After the Quran came down to the people, the tradition of memorizing the verses became present. It is believed that the greater the amount of the Quran memorized, the greater the faith. As technology improved over time, hearing recitations of Quran became more available as well as more tools to help memorize the verses. The tradition of Love Poetry served as a symbolic representation of a Muslim’s desire for a closer contact with their Lord. While the influence of the Quran on Arabic poetry is explained and defended by numerous writers, some writers such as Al- Baqillani believe that poetry and the Quran are in no conceivable way related due to the uniqueness of the Quran. Poetry’s imperfections prove his points that they cannot be compared with the fluency the Quran holds. Classical Arabic is the language of poetry and literature (including news); it is also mainly the language of the Quran. Classical Arabic is closely associated with the religion of Islam because the Quran was written in it. Most of the world’s Muslims do not speak Classical Arabic as their native language, but many can read the Quranic script and recite the Quran. Among non-Arab Muslims, translations of the Quran are most often accompanied by the original text. At present, Modern Standard Arabic (MSA) is also used in modernized versions of literary forms of the Quran. Some Muslims present a monogenesis of languages and claim that the Arabic language was the language revealed by God for the benefit of mankind and the original language as a prototype system of symbolic communication, based upon its system of triconsonantal roots, spoken by man from which all other languages were derived, having first been corrupted. Judaism has a similar account with the Tower of Babel. 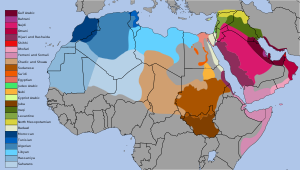 Within the non-peninsula varieties, the largest difference is between the non-Egyptian North African dialects (especially Moroccan Arabic) and the others. Moroccan Arabic in particular is hardly comprehensible to Arabic speakers east of Libya (although the converse is not true, in part due to the popularity of Egyptian films and other media). One factor in the differentiation of the dialects is influence from the languages previously spoken in the areas, which have typically provided a significant number of new words and have sometimes also influenced pronunciation or word order; however, a much more significant factor for most dialects is, as among Romance languages, retention (or change of meaning) of different classical forms. Thus Iraqi aku, Levantine fīh and North African kayən all mean ‘there is’, and all come from Classical Arabic forms (yakūn, fīhi, kā’in respectively), but now sound very different. Transcription is a broad IPA transcription, so minor differences were ignored for easier comparison. Also, the pronunciation of Modern Standard Arabic differs significantly from region to region. Inħobb naqra ħafna. Meta mort il-librerija Ma sibtx dan il-ktieb qadim. Ridt naqra ktieb dwar l-istorja tal-mara fi Franza. Loss of the dual number except on nouns, with consistent plural agreement (cf. feminine singular agreement in plural inanimates). Change of a to i in many affixes (e.g., non-past-tense prefixes ti- yi- ni-; wi- ‘and’; il- ‘the’; feminine -it in the construct state). Loss of third-weak verbs ending in w (which merge with verbs ending in y). Reformation of geminate verbs, e.g., ḥalaltu ‘I untied’ → ḥalēt(u). Conversion of separate words lī ‘to me’, laka ‘to you’, etc. into indirect-object clitic suffixes. Certain changes in the cardinal number system, e.g., khamsat ayyām ‘five days’ → kham(a)s tiyyām, where certain words have a special plural with prefixed t.
Loss of the feminine elative (comparative). Adjective plurals of the form kibār ‘big’ → kubār. Change of nisba suffix -iyy > i. Certain lexical items, e.g., jāb ‘bring’ < jāʼa bi- ‘come with’; shāf ‘see’; ēsh ‘what’ (or similar) < ayyu shayʼ ‘which thing’; illi (relative pronoun). Merger of /ɮˤ/ and /ðˤ/. Levantine Arabic includes North Levantine Arabic, South Levantine Arabic and Cypriot Arabic. It is spoken by about 21 million people in Lebanon, Syria, Jordan, Palestine, Israel, Cyprus and Turkey. Lebanese Arabic is a variety of Levantine Arabic spoken primarily in Lebanon. Jordanian Arabic is a continuum of mutually intelligible varieties of Levantine Arabic spoken by the population of the Kingdom of Jordan. Palestinian Arabic is a name of several dialects of the subgroup of Levantine Arabic spoken by the Palestinians in Palestine, by Arab citizens of Israel and in most Palestinian populations around the world. Maghrebi Arabic, also called “Darija” spoken by about 70 million people in Morocco, Algeria, Tunisia and Libya. It also forms the basis of Maltese, which is not part of the Arabic macrolanguage but is descended from the extinct Sicilian Arabic dialect which had Maghrebi origin. Maghrebi Arabic is very hard to understand for Arabic speakers from the Mashriq or Mesopotamia, the easiest being Libyan Arabic and the hardest Moroccan Arabic. The others such as Algerian Arabic can be considered “in between”. Libyan Arabic spoken in Libya and neighboring countries. Hassaniya Arabic (3 million speakers), spoken in Mauritania, Western Sahara, some parts of northern Mali, southern Morocco and south-western Algeria. Andalusian Arabic, spoken in Spain until the 16th century. Siculo-Arabic (Sicilian Arabic), was spoken in Sicily and Malta between the end of the ninth century and the end of the twelfth century and eventually evolved into the Maltese language. Maltese, spoken on the island of Malta, is the only fully separate standardized language to have originated from an Arabic dialect (the extinct Siculo-Arabic dialect), with independent literary norms. It has its own language code that is distinct from that used for the Arabic macrolanguage. Maltese has evolved independently of Literary Arabic and its varieties into a standardized language over the past 800 years in a gradual process of Latinisation. Maltese is therefore considered an exceptional descendant of Arabic that has no diglossic relationship with Standard Arabic or Classical Arabic. Maltese is also different from Arabic and other Semitic languages since its morphology has been deeply influenced by Romance languages, Italian and Sicilian. It is also the only Semitic language written in the Latin script. In terms of basic everyday language, speakers of Maltese are reported to be able to understand less than a third of what is said to them in Tunisian Arabic, which is related to Siculo-Arabic, whereas speakers of Tunisian are able to understand about 40% of what is said to them in Maltese. This asymmetric intelligibility is considerably lower than the mutual intelligibility found between Maghrebi Arabic dialects. Maltese has its own dialects, with urban varieties of Maltese being closer to Standard Maltese than rural varieties. Mesopotamian Arabic, spoken by about 32 million people in Iraq (where it is called “Aamiyah”), eastern Syria and southwestern Iran (Khuzestan). Baghdad Arabic is the Arabic dialect spoken in Baghdad, the capital of Iraq. It is a subvariety of Mesopotamian Arabic. Kuwaiti Arabic is a Gulf Arabic dialect spoken in Kuwait. Khuzestani Arabic spoken in the Iranian province of Khuzestan. Khorasani Arabic spoken in the Iranian province of Khorasan. Sudanese Arabic is spoken by 17 million people in Sudan and some parts of southern Egypt. Sudanese Arabic is quite distinct from the dialect of its neighbor to the north; rather, the Sudanese have a dialect similar to the Hejazi dialect. Gulf Arabic, spoken by around four million people, predominantly in Kuwait, Bahrain, some parts of Oman, eastern Saudi Arabia coastal areas and some parts of UAE and Qatar. Also spoken in Iran’s Bushehr and Hormozgan provinces. Although Gulf Arabic is spoken in Qatar, most Qatari citizens speak Najdi Arabic (Bedawi). Omani Arabic, distinct from the Gulf Arabic of eastern Arabia and Bahrain, spoken in Central Oman. With recent oil wealth and mobility has spread over other parts of the Sultanate. Yemeni Arabic spoken in Yemen, and southern Saudi Arabia by 15 million people. Similar to Gulf Arabic. Najdi Arabic, spoken by around 10 million people, mainly spoken in Najd, central and northern Saudi Arabia. Most Qatari citizens speak Najdi Arabic (Bedawi). Baharna Arabic (600,000 speakers), spoken by Bahrani Shiʻah in Bahrain and Qatif, the dialect exhibits many big differences from Gulf Arabic. It is also spoken to a lesser extent in Oman. Judeo-Arabic dialects – these are the dialects spoken by the Jews that had lived or continue to live in the Arab World. As Jewish migration to Israel took hold, the language did not thrive and is now considered endangered. So-called Qәltu Arabic. Shirvani Arabic, spoken in Azerbaijan and Dagestan until the 1930s, now extinct. Other changes may also have happened. Classical Arabic pronunciation is not thoroughly recorded and different reconstructions of the sound system of Proto-Semitic propose different phonetic values. One example is the emphatic consonants, which are pharyngealized in modern pronunciations but may have been velarized in the eighth century and glottalized in Proto-Semitic. Reduction of /j/ and /w/ between vowels occurs in a number of circumstances and is responsible for much of the complexity of third-weak (“defective”) verbs. Early Akkadian transcriptions of Arabic names shows that this reduction had not yet occurred as of the early part of the 1st millennium BC. The Classical Arabic language as recorded was a poetic koine that reflected a consciously archaizing dialect, chosen based on the tribes of the western part of the Arabian Peninsula, who spoke the most conservative variants of Arabic. Even at the time of Muhammed and before, other dialects existed with many more changes, including the loss of most glottal stops, the loss of case endings, the reduction of the diphthongs /aj/ and /aw/ into monophthongs /eː, oː/, etc. Most of these changes are present in most or all modern varieties of Arabic. An interesting feature of the writing system of the Quran (and hence of Classical Arabic) is that it contains certain features of Muhammad’s native dialect of Mecca, corrected through diacritics into the forms of standard Classical Arabic. Among these features visible under the corrections are the loss of the glottal stop and a differing development of the reduction of certain final sequences containing /j/: Evidently, final /-awa/ became /aː/ as in the Classical language, but final /-aja/ became a different sound, possibly /eː/ (rather than again /aː/ in the Classical language). This is the apparent source of the alif maqṣūrah ‘restricted alif’ where a final /-aja/ is reconstructed: a letter that would normally indicate /j/ or some similar high-vowel sound, but is taken in this context to be a logical variant of alif and represent the sound /aː/. Although Classical Arabic was a unitary language and is now used in Quran, its pronunciation varies somewhat from country to country and from region to region within a country. It is influenced by colloquial dialects. The “colloquial” spoken dialects of Arabic are learned at home and constitute the native languages of Arabic speakers. “Formal” Literary Arabic (usually specifically Modern Standard Arabic) is learned at school; although many speakers have a native-like command of the language, it is technically not the native language of any speakers. Both varieties can be both written and spoken, although the colloquial varieties are rarely written down and the formal variety is spoken mostly in formal circumstances, e.g., in radio and TV broadcasts, formal lectures, parliamentary discussions and to some extent between speakers of different colloquial dialects. Even when the literary language is spoken, however, it is normally only spoken in its pure form when reading a prepared text out loud and communication between speakers of different colloquial dialects. When speaking extemporaneously (i.e. making up the language on the spot, as in a normal discussion among people), speakers tend to deviate somewhat from the strict literary language in the direction of the colloquial varieties. In fact, there is a continuous range of “in-between” spoken varieties: from nearly pure Modern Standard Arabic (MSA), to a form that still uses MSA grammar and vocabulary but with significant colloquial influence, to a form of the colloquial language that imports a number of words and grammatical constructions in MSA, to a form that is close to pure colloquial but with the “rough edges” (the most noticeably “vulgar” or non-Classical aspects) smoothed out, to pure colloquial. The particular variant (or register) used depends on the social class and education level of the speakers involved and the level of formality of the speech situation. Often it will vary within a single encounter, e.g., moving from nearly pure MSA to a more mixed language in the process of a radio interview, as the interviewee becomes more comfortable with the interviewer. This type of variation is characteristic of the diglossia that exists throughout the Arabic-speaking world. Although Modern Standard Arabic (MSA) is a unitary language, its pronunciation varies somewhat from country to country and from region to region within a country. The variation in individual “accents” of MSA speakers tends to mirror corresponding variations in the colloquial speech of the speakers in question, but with the distinguishing characteristics moderated somewhat. Note that it is important in descriptions of “Arabic” phonology to distinguish between pronunciation of a given colloquial (spoken) dialect and the pronunciation of MSA by these same speakers. Although they are related, they are not the same. For example, the phoneme that derives from Classical Arabic /ɟ/ has many different pronunciations in the modern spoken varieties, e.g., [d͡ʒ ~ ʒ ~ j ~ ɡʲ ~ ɡ] including the proposed original [ɟ]. Speakers whose native variety has either [d͡ʒ] or [ʒ] will use the same pronunciation when speaking MSA. Even speakers from Cairo, whose native Egyptian Arabic has [ɡ], normally use [ɡ] when speaking MSA. The [j] of Persian Gulf speakers is the only variant pronunciation which isn’t found in MSA; [d͡ʒ~ʒ] is used instead, but may use [j] in MSA for comfortable pronunciation. Another reason of different pronunciations is influence of colloquial dialects. The differentiation of pronunciation of colloquial dialects is the influence from other languages previously spoken and some still presently spoken in the regions, such as Coptic in Egypt, Berber, Punic or Phoenician in North Africa, Himyaritic, Modern South Arabian and Old South Arabian in Yemen and Oman, Aramaic and Canaanite languages (including Phoenician) in the Levant and Mesopotamia. Modern Standard Arabic has six pure vowels (while most modern dialects have eight pure vowels which includes the long vowels /eː oː/), with short /a i u/ and corresponding long vowels /aː iː uː/. There are also two diphthongs: /aj/ and /aw/. The pronunciation of the vowels differs from speaker to speaker, in a way that tends to reflect the pronunciation of the corresponding colloquial variety. Nonetheless, there are some common trends. Most noticeable is the differing pronunciation of /a/ and /aː/, which tend towards fronted [æ(ː)], [a(ː)] or [ɛ(ː)] in most situations, but a back [ɑ(ː)] in the neighborhood of emphatic consonants. Some accents and dialects, such as those of the Hejaz region, have an open [a(ː)] or a central [ä(ː)] in all situations. The vowel /a/ varies towards [ə(ː)] too. Listen to the final vowel in the recording of al-ʻarabiyyah at the beginning of this article, for example. The point is, Arabic has only three short vowel phonemes, so those phonemes can have a very wide range of allophones. The vowels /u/ and /ɪ/ are often affected somewhat in emphatic neighborhoods as well, with generally more back or centralized allophones, but the differences are less great than for the low vowels. The pronunciation of short /u/ and /i/ tends towards [ʊ~o] and [i~e~ɨ], respectively, in many dialects. The definition of both “emphatic” and “neighborhood” vary in ways that reflect (to some extent) corresponding variations in the spoken dialects. Generally, the consonants triggering “emphatic” allophones are the pharyngealized consonants /tˤ dˤ sˤ ðˤ/; /q/; and /r/, if not followed immediately by /i(ː)/. Frequently, the velar fricatives /x ɣ/ also trigger emphatic allophones; occasionally also the pharyngeal consonants /ʕ ħ/ (the former more than the latter). Many dialects have multiple emphatic allophones of each vowel, depending on the particular nearby consonants. In most MSA accents, emphatic coloring of vowels is limited to vowels immediately adjacent to a triggering consonant, although in some it spreads a bit farther: e.g., وقت‎ waqt [wɑqt] ‘time’; وطن‎ waṭan [wɑtˤɑn] ‘homeland’; وسط المدينة‎ wasṭ al-madīnah [wæstˤɑl-mædiːnɐ] ‘downtown’ (sometimes [wɑstˤɑl-mædiːnæ] or similar). In a non-emphatic environment, the vowel /a/ in the diphthong /aj/ tends to be fronted even more than elsewhere, often pronounced [æj] or [ɛj]: hence سيف‎ sayf [sajf ~ sæjf ~ sɛjf] ‘sword’ but صيف‎ ṣayf [sˤɑjf] ‘summer’. However, in accents with no emphatic allophones of /a/ (e.g., in the Hejaz), the pronunciation [aj] or [äj] occurs in all situations. The phoneme /d͡ʒ/ is represented by the Arabic letter jīm (ج‎) and has many standard pronunciations. [d͡ʒ] is characteristic of north Algeria, Iraq, also in most of the Arabian peninsula but with an allophonic [ʒ] in some positions; [ʒ] occurs in most of the Levant and most North Africa; and [ɡ] is used in most of Egypt and some regions in Yemen and Oman. Generally this corresponds with the pronunciation in the colloquial dialects. In some regions in Sudan and Yemen, as well as in some Sudanese and Yemeni dialects, it may be either [ɡʲ] or [ɟ], representing the original pronunciation of Classical Arabic. Foreign words containing /ɡ/ may be transcribed with ج‎, غ‎, ك‎, ق‎, گ‎, ݣ or ڨ, mainly depending on the regional spoken variety of Arabic or the commonly diacriticized Arabic letter. Note also that in northern Egypt, where the Arabic letter jīm (ج‎) is normally pronounced [ɡ], a separate phoneme /ʒ/, which may be transcribed with چ‎, occurs in a small number of mostly non-Arabic loanwords, e.g., /ʒakitta/ ‘jacket’. /θ/ (ث‎) can be pronounced as [t] or even [s]. In some places of Maghreb it can be also pronounced as [t͡s]. /x/ and /ɣ/ (خ,‎ غ‎) are velar, post-velar, or uvular. In many varieties, /ħ, ʕ/ (ح,‎ ع‎) are actually epiglottal [ʜ, ʢ] (despite what is reported in many earlier works). /l/ is pronounced as velarized [ɫ] in الله /ʔallaːh/, the name of God, q.e. Allah, when the word follows a, ā, u or ū (after i or ī it is unvelarized: بسم الله‎ bismi l–lāh /bismillaːh/). Some speakers velarize other occurrences of /l/ in MSA, in imitation of their spoken dialects. Arabic has consonants traditionally termed “emphatic” /tˤ, dˤ, sˤ, ðˤ/ (ط,‎ ض,‎ ص,‎ ظ‎), which exhibit simultaneous pharyngealization [tˤ, dˤ, sˤ, ðˤ] as well as varying degrees of velarization [tˠ, dˠ, sˠ, ðˠ], so they may be written with the “Velarized or pharyngealized” diacritic ( ̴) as: /t̴, d̴, s̴, ð̴/. This simultaneous articulation is described as “Retracted Tongue Root” by phonologists. In some transcription systems, emphasis is shown by capitalizing the letter, for example, /dˤ/ is written ⟨D⟩; in others the letter is underlined or has a dot below it, for example, ⟨ḍ⟩. Vowels and consonants can be phonologically short or long. Long (geminate) consonants are normally written doubled in Latin transcription (i.e. bb, dd, etc. ), reflecting the presence of the Arabic diacritic mark shaddah, which indicates doubled consonants. In actual pronunciation, doubled consonants are held twice as long as short consonants. This consonant lengthening is phonemically contrastive: قبل‎ qabila ‘he accepted’ vs. قبّل‎ qabbala ‘he kissed’. If the word occurs after another word ending in a consonant, there is a smooth transition from final consonant to initial vowel, e.g., اجتماع‎ al-ijtimāʻ ‘meeting’ /alid͡ʒtimaːʕ/. If the word occurs after another word ending in a vowel, the initial vowel of the word is elided, e.g., بيت المدير‎ baytu (a)l-mudīr ‘house of the director’ /bajtulmudiːr/. If the word occurs at the beginning of an utterance, a glottal stop [ʔ] is added onto the beginning, e.g., البيت هو‎ al-baytu huwa … ‘The house is …’ /ʔalbajtuhuwa … /. A final vowel, long or short, may not be stressed. Only one of the last three syllables may be stressed. Given this restriction, the last heavy syllable (containing a long vowel or ending in a consonant) is stressed, if it is not the final syllable. If the final syllable is super heavy and closed (of the form CVVC or CVCC) it receives stress. If no syllable is heavy or super heavy, the first possible syllable (i.e. third from end) is stressed. As a special exception, in Form VII and VIII verb forms stress may not be on the first syllable, despite the above rules: Hence inkatab(a) ‘he subscribed’ (whether or not the final short vowel is pronounced), yankatib(u) ‘he subscribes’ (whether or not the final short vowel is pronounced), yankatib ‘he should subscribe (juss.)’. Likewise Form VIII ishtarā ‘he bought’, yashtarī ‘he buys’. Examples:kitāb(un) ‘book’, kā-ti-b(un) ‘writer’, mak-ta-b(un) ‘desk’, ma-kā-ti-b(u) ‘desks’, mak-ta-ba-tun ‘library’ (but mak-ta-ba(-tun) ‘library’ in short pronunciation), ka-ta-bū (Modern Standard Arabic) ‘they wrote’ = ka-ta-bu (dialect), ka-ta-bū-h(u) (Modern Standard Arabic) ‘they wrote it’ = ka-ta-bū (dialect), ka-ta-ba-tā (Modern Standard Arabic) ‘they (dual, fem) wrote’, ka-tab-tu (Modern Standard Arabic) ‘I wrote’ = ka-tabt (short form or dialect). Doubled consonants count as two consonants: ma-jal-la-(tan) ‘magazine’, ma-ḥall(-un) “place”. These rules may result in differently stressed syllables when final case endings are pronounced, vs. the normal situation where they are not pronounced, as in the above example of mak-ta-ba-tun ‘library’ in full pronunciation, but mak-ta-ba(-tun) ‘library’ in short pronunciation. The restriction on final long vowels does not apply to the spoken dialects, where original final long vowels have been shortened and secondary final long vowels have arisen from loss of original final -hu/hi. The entire indefinite noun endings -in and -un (with nunation) are left off. The ending -an is left off of nouns preceded by a tāʾ marbūṭah ة (i.e. the -t in the ending -at- that typically marks feminine nouns), but pronounced as -ā in other nouns (hence its writing in this fashion in the Arabic script). The nunation endings -an -in -un are not pronounced. However, they are pronounced in adverbial accusative formations, e.g., taqrīban تَقْرِيبًا ‘almost, approximately’, ʻādatan عَادَةً ‘usually’. The tāʾ marbūṭah ending ة is unpronounced, except in construct state nouns, where it sounds as t (and in adverbial accusative constructions, e.g., ʻādatan عَادَةً ‘usually’, where the entire -tan is pronounced). The masculine singular nisbah ending -iyy is actually pronounced -ī and is unstressed (but plural and feminine singular forms, i.e. when followed by a suffix, still sound as -iyy-). Full endings (including case endings) occur when a clitic object or possessive suffix is added (e.g., -nā ‘us/our’). All the rules for formal short pronunciation apply, except as follows. The past tense singular endings written formally as -tu -ta -ti are pronounced -t -t -ti. But masculine ʾanta is pronounced in full. A short vowel (e.g., -i- or -ǝ-) is consistently added, either between the second and third or the first and second consonants. Or, a short vowel is added only if an otherwise unpronounceable sequence occurs, typically due to a violation of the sonority hierarchy (e.g., -rtn- is pronounced as a three-consonant cluster, but -trn- needs to be broken up). Or, a short vowel is never added, but consonants like r l m n occurring between two other consonants will be pronounced as a syllabic consonant (as in the English words “butter bottle bottom button”). The clitic suffixes themselves tend also to be changed, in a way that avoids many possible occurrences of three-consonant clusters. In particular, -ka -ki -hu generally sound as -ak -ik -uh. Final long vowels are often shortened, merging with any short vowels that remain. Feminine plural endings in verbs and clitic suffixes will often drop out, with the masculine plural endings used instead. If the speaker’s native variety has feminine plural endings, they may be preserved, but will often be modified in the direction of the forms used in the speaker’s native variety, e.g. -an instead of -na. Dual endings will often drop out except on nouns and then used only for emphasis (similar to their use in the colloquial varieties); elsewhere, the plural endings are used (or feminine singular, if appropriate). As mentioned above, many spoken dialects have a process of emphasis spreading, where the “emphasis” (pharyngealization) of emphatic consonants spreads forward and back through adjacent syllables, pharyngealizing all nearby consonants and triggering the back allophone [ɑ(ː)] in all nearby low vowels. The extent of emphasis spreading varies. For example, in Moroccan Arabic, it spreads as far as the first full vowel (i.e. sound derived from a long vowel or diphthong) on either side; in many Levantine dialects, it spreads indefinitely, but is blocked by any /j/ or /ʃ/; while in Egyptian Arabic, it usually spreads throughout the entire word, including prefixes and suffixes. In Moroccan Arabic, /i u/ also have emphatic allophones [e~ɛ] and [o~ɔ], respectively. Unstressed short vowels, especially /i u/, are deleted in many contexts. Many sporadic examples of short vowel change have occurred (especially /a/→/i/ and interchange /i/↔/u/). Most Levantine dialects merge short /i u/ into /ə/ in most contexts (all except directly before a single final consonant). In Moroccan Arabic, on the other hand, short /u/ triggers labialization of nearby consonants (especially velar consonants and uvular consonants), and then short /a i u/ all merge into /ə/, which is deleted in many contexts. (The labialization plus /ə/ is sometimes interpreted as an underlying phoneme /ŭ/.) This essentially causes the wholesale loss of the short-long vowel distinction, with the original long vowels /aː iː uː/ remaining as half-long [aˑ iˑ uˑ], phonemically /a i u/, which are used to represent both short and long vowels in borrowings from Literary Arabic. Most spoken dialects have monophthongized original /aj aw/ to /eː oː/ in most circumstances, including adjacent to emphatic consonants, while keeping them as the original diphthongs in others e.g. مَوْعِد‎ /mawʕid/. In most of the Moroccan, Algerian and Tunisian (except Sahil and Southeastern) Arabic dialects, they have subsequently merged into original /iː uː/. In some dialects, there may be more or fewer phonemes than those listed in the chart above. For example, non-Arabic [v] is used in the Maghrebi dialects as well in the written language mostly for foreign names. Semitic [p] became [f] extremely early on in Arabic before it was written down; a few modern Arabic dialects, such as Iraqi (influenced by Persian and Kurdish) distinguish between [p] and [b]. The Iraqi Arabic also uses sounds [ɡ], [t͡ʃ] and uses Persian adding letters, e.g. : گوجة gawjah – a plum; چمة chimah – a truffle and so on. Early in the expansion of Arabic, the separate emphatic phonemes [ɮˤ] and [ðˤ] coalesced into a single phoneme [ðˤ]. Many dialects (such as Egyptian, Levantine, and much of the Maghreb) subsequently lost interdental fricatives, converting [θ ð ðˤ] into [t d dˤ]. Most dialects borrow “learned” words from the Standard language using the same pronunciation as for inherited words, but some dialects without interdental fricatives (particularly in Egypt and the Levant) render original [θ ð ðˤ dˤ] in borrowed words as [s z zˤ dˤ]. ق‎ /q/ retains its original pronunciation in widely scattered regions such as Yemen, Morocco, and urban areas of the Maghreb. It is pronounced as a glottal stop [ʔ] in several prestige dialects, such as those spoken in Cairo, Beirut and Damascus. But it is rendered as a voiced velar plosive [ɡ] in Persian Gulf, Upper Egypt, parts of the Maghreb, and less urban parts of the Levant (e.g. Jordan). In Iraqi Arabic it sometimes retains its original pronunciation and is sometimes rendered as a voiced velar plosive, depending on the word. Some traditionally Christian villages in rural areas of the Levant render the sound as [k], as do Shiʻi Bahrainis. In some Gulf dialects, it is palatalized to [d͡ʒ] or [ʒ]. It is pronounced as a voiced uvular constrictive [ʁ] in Sudanese Arabic. Many dialects with a modified pronunciation for /q/ maintain the [q] pronunciation in certain words (often with religious or educational overtones) borrowed from the Classical language. ج‎ /d͡ʒ/ is pronounced as an affricate in Iraq and much of the Arabian Peninsula, but is pronounced [ɡ] in most of North Egypt and parts of Yemen and Oman, [ʒ] in Morocco, Tunisia and the Levant, and [j], [i̠] in most words in much of the Persian Gulf. ك‎ /k/ usually retains its original pronunciation, but is palatalized to /t͡ʃ/ in many words in Israel and the Palestinian Territories, Iraq, and countries in the eastern part of the Arabian Peninsula. Often a distinction is made between the suffixes /-ak/ (‘you’, masc.) and /-ik/ (‘you’, fem. ), which become /-ak/ and /-it͡ʃ/, respectively. In Sana’a, Omani, and Bahrani /-ik/ is pronounced /-iʃ/. As in other Semitic languages, Arabic has a complex and unusual morphology (i.e. method of constructing words from a basic root). Arabic has a nonconcatenative “root-and-pattern” morphology: A root consists of a set of bare consonants (usually three), which are fitted into a discontinuous pattern to form words. For example, the word for ‘I wrote’ is constructed by combining the root k-t-b ‘write’ with the pattern -a-a-tu ‘I Xed’ to form katabtu ‘I wrote’. Other verbs meaning ‘I Xed’ will typically have the same pattern but with different consonants, e.g. qaraʼtu ‘I read’, akaltu ‘I ate’, dhahabtu ‘I went’, although other patterns are possible (e.g. sharibtu ‘I drank’, qultu ‘I said’, takallamtu ‘I spoke’, where the subpattern used to signal the past tense may change but the suffix -tu is always used). Nouns in Literary Arabic have three grammatical cases (nominative, accusative, and genitive [also used when the noun is governed by a preposition]); three numbers (singular, dual and plural); two genders (masculine and feminine); and three “states” (indefinite, definite, and construct). The cases of singular nouns (other than those that end in long ā) are indicated by suffixed short vowels (/-u/ for nominative, /-a/ for accusative, /-i/ for genitive). The feminine singular is often marked by /-at/, which is reduced to /-ah/ or /-a/ before a pause. Plural is indicated either through endings (the sound plural) or internal modification (the broken plural). Definite nouns include all proper nouns, all nouns in “construct state” and all nouns which are prefixed by the definite article /al-/. Indefinite singular nouns (other than those that end in long ā) add a final /-n/ to the case-marking vowels, giving /-un/, /-an/ or /-in/ (which is also referred to as nunation or tanwīn). Adjectives in Literary Arabic are marked for case, number, gender and state, as for nouns. However, the plural of all non-human nouns is always combined with a singular feminine adjective, which takes the /-ah/ or /-at/ suffix. Nouns, verbs, pronouns and adjectives agree with each other in all respects. However, non-human plural nouns are grammatically considered to be feminine singular. Furthermore, a verb in a verb-initial sentence is marked as singular regardless of its semantic number when the subject of the verb is explicitly mentioned as a noun. Numerals between three and ten show “chiasmic” agreement, in that grammatically masculine numerals have feminine marking and vice versa. Verbs in Literary Arabic are marked for person (first, second, or third), gender, and number. They are conjugated in two major paradigms (past and non-past); two voices (active and passive); and six moods (indicative, imperative, subjunctive, jussive, shorter energetic and longer energetic), the fifth and sixth moods, the energetics, exist only in Classical Arabic but not in MSA. There are also two participles (active and passive) and a verbal noun, but no infinitive. The past and non-past paradigms are sometimes also termed perfective and imperfective, indicating the fact that they actually represent a combination of tense and aspect. The moods other than the indicative occur only in the non-past, and the future tense is signaled by prefixing sa- or sawfa onto the non-past. The past and non-past differ in the form of the stem (e.g., past katab- vs. non-past -ktub-), and also use completely different sets of affixes for indicating person, number and gender: In the past, the person, number and gender are fused into a single suffixal morpheme, while in the non-past, a combination of prefixes (primarily encoding person) and suffixes (primarily encoding gender and number) are used. The passive voice uses the same person/number/gender affixes but changes the vowels of the stem. The following shows a paradigm of a regular Arabic verb, kataba ‘to write’. Note that in Modern Standard, the energetic mood (in either long or short form, which have the same meaning) is almost never used. Like other Semitic languages, and unlike most other languages, Arabic makes much more use of nonconcatenative morphology (applying a large number of templates applied roots) to derive words than adding prefixes or suffixes to words. For verbs, a given root can occur in many different derived verb stems (of which there are about fifteen), each with one or more characteristic meanings and each with its own templates for the past and non-past stems, active and passive participles, and verbal noun. These are referred to by Western scholars as “Form I”, “Form II”, and so on through “Form XV” (although Forms XI to XV are rare). These stems encode grammatical functions such as the causative, intensive and reflexive. Stems sharing the same root consonants represent separate verbs, albeit often semantically related, and each is the basis for its own conjugational paradigm. As a result, these derived stems are part of the system of derivational morphology, not part of the inflectional system. Form II is sometimes used to create transitive denominative verbs (verbs built from nouns); Form V is the equivalent used for intransitive denominatives. The associated participles and verbal nouns of a verb are the primary means of forming new lexical nouns in Arabic. This is similar to the process by which, for example, the English gerund “meeting” (similar to a verbal noun) has turned into a noun referring to a particular type of social, often work-related event where people gather together to have a “discussion” (another lexicalized verbal noun). Another fairly common means of forming nouns is through one of a limited number of patterns that can be applied directly to roots, such as the “nouns of location” in ma- (e.g. maktab ‘desk, office’ < k-t-b ‘write’, maṭbakh ‘kitchen’ < ṭ-b-kh ‘cook’). The feminine suffix -ah; variously derives terms for women from related terms for men, or more generally terms along the same lines as the corresponding masculine, e.g. maktabah ‘library’ (also a writing-related place, but different from maktab, as above). The nisbah suffix -iyy-. This suffix is extremely productive, and forms adjectives meaning “related to X”. It corresponds to English adjectives in -ic, -al, -an, -y, -ist, etc. The feminine nisbah suffix -iyyah. This is formed by adding the feminine suffix -ah onto nisba adjectives to form abstract nouns. For example, from the basic root sh-r-k ‘share’ can be derived the Form VIII verb ishtaraka ‘to cooperate, participate’, and in turn its verbal noun ishtirāk ‘cooperation, participation’ can be formed. This in turn can be made into a nisbah adjective ishtirākī ‘socialist’, from which an abstract noun ishtirākiyyah ‘socialism’ can be derived. Other recent formations are jumhūriyyah ‘republic’ (lit. “public-ness”, < jumhūr ‘multitude, general public’), and the Gaddafi-specific variation jamāhīriyyah ‘people’s republic’ (lit. “masses-ness”, < jamāhīr ‘the masses’, pl. of jumhūr, as above). The spoken dialects have lost the case distinctions and make only limited use of the dual (it occurs only on nouns and its use is no longer required in all circumstances). They have lost the mood distinctions other than imperative, but many have since gained new moods through the use of prefixes (most often /bi-/ for indicative vs. unmarked subjunctive). They have also mostly lost the indefinite “nunation” and the internal passive. The following is an example of a regular verb paradigm in Egyptian Arabic. The Arabic alphabet derives from the Aramaic through Nabatean, to which it bears a loose resemblance like that of Coptic or Cyrillic scripts to Greek script. Traditionally, there were several differences between the Western (North African) and Middle Eastern versions of the alphabet—in particular, the faʼ had a dot underneath and qaf a single dot above in the Maghreb, and the order of the letters was slightly different (at least when they were used as numerals). However, the old Maghrebi variant has been abandoned except for calligraphic purposes in the Maghreb itself, and remains in use mainly in the Quranic schools (zaouias) of West Africa. Arabic, like all other Semitic languages (except for the Latin-written Maltese, and the languages with the Ge’ez script), is written from right to left. There are several styles of script, notably naskh, which is used in print and by computers, and ruqʻah, which is commonly used in handwriting. After Khalil ibn Ahmad al Farahidi finally fixed the Arabic script around 786, many styles were developed, both for the writing down of the Quran and other books, and for inscriptions on monuments as decoration. 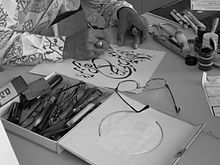 Arabic calligraphy has not fallen out of use as calligraphy has in the Western world, and is still considered by Arabs as a major art form; calligraphers are held in great esteem. Being cursive by nature, unlike the Latin script, Arabic script is used to write down a verse of the Quran, a hadith, or simply a proverb. The composition is often abstract, but sometimes the writing is shaped into an actual form such as that of an animal. One of the current masters of the genre is Hassan Massoudy. In modern times the intrinsically calligraphic nature of the written Arabic form is haunted by the thought that a typographic approach to the language, necessary for digitized unification, will not always accurately maintain meanings conveyed through calligraphy. There are a number of different standards for the romanization of Arabic, i.e. methods of accurately and efficiently representing Arabic with the Latin script. There are various conflicting motivations involved, which leads to multiple systems. Some are interested in transliteration, i.e. representing the spelling of Arabic, while others focus on transcription, i.e. representing the pronunciation of Arabic. (They differ in that, for example, the same letter ي‎ is used to represent both a consonant, as in “you” or “yet”, and a vowel, as in “me” or “eat”.) Some systems, e.g. for scholarly use, are intended to accurately and unambiguously represent the phonemes of Arabic, generally making the phonetics more explicit than the original word in the Arabic script. These systems are heavily reliant on diacritical marks such as “š” for the sound equivalently written sh in English. Other systems (e.g. the Bahá’í orthography) are intended to help readers who are neither Arabic speakers nor linguists with intuitive pronunciation of Arabic names and phrases. These less “scientific” systems tend to avoid diacritics and use digraphs (like sh and kh). These are usually simpler to read, but sacrifice the definiteness of the scientific systems, and may lead to ambiguities, e.g. whether to interpret sh as a single sound, as in gash, or a combination of two sounds, as in gashouse. The ALA-LC romanization solves this problem by separating the two sounds with a prime symbol ( ′ ); e.g., as′hal ‘easier’. During the last few decades and especially since the 1990s, Western-invented text communication technologies have become prevalent in the Arab world, such as personal computers, the World Wide Web, email, bulletin board systems, IRC, instant messaging and mobile phone text messaging. Most of these technologies originally had the ability to communicate using the Latin script only, and some of them still do not have the Arabic script as an optional feature. As a result, Arabic speaking users communicated in these technologies by transliterating the Arabic text using the Latin script, sometimes known as IM Arabic. To handle those Arabic letters that cannot be accurately represented using the Latin script, numerals and other characters were appropriated. For example, the numeral “3” may be used to represent the Arabic letter ⟨ع‎⟩. There is no universal name for this type of transliteration, but some have named it Arabic Chat Alphabet. Other systems of transliteration exist, such as using dots or capitalization to represent the “emphatic” counterparts of certain consonants. For instance, using capitalization, the letter ⟨د‎⟩, may be represented by d. Its emphatic counterpart, ⟨ض‎⟩, may be written as D.
Academy of the Arabic Language is the name of a number of language-regulation bodies formed in the Arab League. The most active are in Damascus and Cairo. They review language development, monitor new words and approve inclusion of new words into their published standard dictionaries. They also publish old and historical Arabic manuscripts. Arabic has been taught worldwide in many elementary and secondary schools, especially Muslim schools. Universities around the world have classes that teach Arabic as part of their foreign languages, Middle Eastern studies, and religious studies courses. Arabic language schools exist to assist students to learn Arabic outside the academic world. There are many Arabic language schools in the Arab world and other Muslim countries. Because the Quran is written in Arabic and all Islamic terms are in Arabic, millions of Muslims (both Arab and non-Arab) study the language. Software and books with tapes are also important part of Arabic learning, as many of Arabic learners may live in places where there are no academic or Arabic language school classes available. Radio series of Arabic language classes are also provided from some radio stations. A number of websites on the Internet provide online classes for all levels as a means of distance education; most teach Modern Standard Arabic, but some teach regional varieties from numerous countries. With the sole example of Medieval linguist Abu Hayyan al-Gharnati – who, while a scholar of the Arabic language, was not ethnically Arab – Medieval scholars of the Arabic language made no efforts at studying comparative linguistics, considering all other languages inferior. ^ a b “Arabic – Ethnologue”. Ethnologue. Simons, Gary F. and Charles D. Fennig (eds.). 2018. Ethnologue: Languages of the World, 21st edition. Archived from the original on 5 January 2016. Retrieved 21 February 2018. ^ “Journal Officiel de la Republique du Senegal”. Archived from the original on 18 May 2015. Retrieved 8 August 2018. ^ Hammarström, Harald; Forkel, Robert; Haspelmath, Martin, eds. (2017). “Arabic”. Glottolog 3.0. Jena, Germany: Max Planck Institute for the Science of Human History. ^ Semitic languages: an international handbook / edited by Stefan Weninger; in collaboration with Geoffrey Khan, Michael P. Streck, Janet C. E.Watson; Walter de Gruyter GmbH & Co. KG, Berlin/Boston, 2011. ^ “Al-Jallad. The earliest stages of Arabic and its linguistic classification (Routledge Handbook of Arabic Linguistics, forthcoming)”. Archived from the original on 23 October 2017. Retrieved 27 October 2016. ^ a b “Documentation for ISO 639 identifier: ara”. Archived from the original on 3 March 2016. Retrieved 20 March 2018. ^ Abdulkafi Albirini. 2016. Modern Arabic Sociolinguistics (pp. 34–35). ^ Tomasz Kamusella. 2017. The Arabic Language: A Latin of Modernity? (pp. 117–145). Journal of Nationalism, Memory and Language Politics. Vol. 11, No 2. ^ “Christianity 2015: Religious Diversity and Personal Contact” (PDF). gordonconwell.edu. January 2015. Archived (PDF) from the original on 25 May 2017. Retrieved 29 May 2015. ^ “Executive Summary”. Future of the Global Muslim Population. Pew Research Center. 27 January 2011. Archived from the original on 5 August 2013. Retrieved 22 December 2011. ^ “Table: Muslim Population by Country”. Pew Research Center’s Religion & Public Life Project. 27 January 2011. Archived from the original on 1 August 2013. Retrieved 18 May 2014. ^ “UN official languages”. un.org. 18 November 2014. Archived from the original on 17 October 2015. Retrieved 18 October 2015. ^ “World Arabic Language Day”. UNESCO. 18 December 2014. Archived from the original on 27 October 2017. Retrieved 12 February 2014. ^ Al-Jallad, Ahmad (2015). An Outline of the Grammar of the Safaitic Inscriptions. Brill. ISBN 978-90-04-28982-6. ^ Al-Jallad, Ahmad. “Al-Jallad. 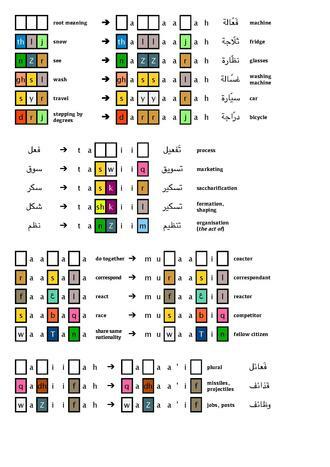 The earliest stages of Arabic and its linguistic classification (Routledge Handbook of Arabic Linguistics, forthcoming)”. Archived from the original on 23 October 2017. Retrieved 15 July 2016. ^ Lentin, Jérôme (30 May 2011). “Middle Arabic”. Encyclopedia of Arabic Language and Linguistics. Brill Reference. Archived from the original on 15 August 2016. Retrieved 17 July 2016. ^ a b Al-Jallad, Ahmad (30 May 2011). “Polygenesis in the Arabic Dialects”. Encyclopedia of Arabic Language and Linguistics. Brill Reference. Archived from the original on 15 August 2016. Retrieved 17 July 2016. ^ Versteegh, Kees (2014). The Arabic Language. Edinburgh University Press. ISBN 978-0-7486-4529-9. Archived from the original on 4 October 2018. Retrieved 16 May 2017. ^ Retsö, Jan (1989). Diathesis in the Semitic Languages: A Comparative Morphological Study. Brill. ISBN 978-90-04-08818-4. Archived from the original on 4 October 2018. Retrieved 16 May 2017. ^ “Arabic Language.” Microsoft Encarta Online Encyclopedia 2009. ^ Proceedings and Debates of the 107th United States Congress Congressional Record, p. 10,462. Washington, DC: United States Government Printing Office, 2002. ^ “Teaching Arabic in France”. The Economist. Archived from the original on 25 September 2018. Retrieved 26 September 2018. ^ “Top 50 English Words – of Arabic Origin”. blogs.transparent.com. Arabic Language Blog. Retrieved 14 December 2018. ^ EB staff. “Maltese language – Britannica Online Encyclopedia”. Britannica.com. Archived from the original on 5 June 2008. Retrieved 4 May 2010. ^ See for instance Wilhelm Eilers, “Iranisches Lehngut im Arabischen”, Actas IV. Congresso des Estudos Árabes et Islâmicos, Coimbra, Lisboa, Leiden 1971, with earlier references. ^ a b c d e f g Shrivtiel, Shraybom (1998). The Question of Romanisation of the Script and The Emergence of Nationalism in the Middle East. Mediterranean Language Review. pp. 179–196. ^ a b Nicholson, Reynold. A Literary History of the arabs. The Syndics of the Cambridge University Press. ^ a b c Allen, Roger (2000). An introduction to Arabic literature (1. publ. ed.). Cambridge [u.a. ]: Cambridge Univ. Press. ISBN 978-0-521-77657-8. ^ a b Cobham, Adonis; translated from the Arabic by Catherine (1990). An introduction to Arab poetics (1st ed.). Austin: University of Texas Press. ISBN 978-0-292-73859-1. ^ “Arabic – the mother of all languages – Al Islam Online”. Alislam.org. Archived from the original on 30 April 2010. Retrieved 4 May 2010. ^ Coffman, James (December 1995). “Does the Arabic Language Encourage Radical Islam?”. Middle East Quarterly. Archived from the original on 1 February 2009. Retrieved 5 December 2008. ^ Arabic, Egyptian Spoken (18th ed.). Ethnologue. 2006. Archived from the original on 25 February 2015. Retrieved 28 January 2015. ^ a b Borg, Albert J.; Azzopardi-Alexander, Marie (1997). Maltese. Routledge. ISBN 0-415-02243-6. ^ Brincat, 2005. Maltese – an unusual formula. Archived from the original on 8 December 2015. Retrieved 17 February 2018. Originally Maltese was an Arabic dialect but it was immediately exposed to Latinisation because the Normans conquered the islands in 1090, while Christianisation, which was complete by 1250, cut off the dialect from contact with Classical Arabic. Consequently Maltese developed on its own, slowly but steadily absorbing new words from Sicilian and Italian according to the needs of the developing community. ^ Robert D Hoberman (2007). Morphologies of Asia and Africa, Alan S. Kaye (Ed. ), Chapter 13: Maltese Morphology. Eisenbrown. ISBN 978-1-57506-109-2. Archived from the original on 4 October 2018. Retrieved 17 February 2018. Maltese is the chief exception: Classical or Standard Arabic is irrelevant in the Maltese linguistic community and there is no diglossia. ^ Robert D Hoberman (2007). Morphologies of Asia and Africa, Alan S. Kaye (Ed. ), Chapter 13: Maltese Morphology. Eisenbrown. ISBN 978-1-57506-109-2. Archived from the original on 4 October 2018. Retrieved 17 February 2018. yet it is in its morphology that Maltese also shows the most elaborate and deeply embedded influence from the Romance languages, Sicilian and Italian, with which it has long been in intimate contact….As a result Maltese is unique and different from Arabic and other Semitic languages. ^ “Mutual Intelligibility of Spoken Maltese, Libyan Arabic and Tunisian Arabic Functionally Tested: A Pilot Study”. p. 1. Retrieved 23 September 2017. To summarise our findings, we might observe that when it comes to the most basic everyday language, as reflected in our data sets, speakers of Maltese are able to understand less than a third of what is being said to them in either Tunisian or Benghazi Libyan Arabic. ^ “Mutual Intelligibility of Spoken Maltese, Libyan Arabic and Tunisian Arabic Functionally Tested: A Pilot Study”. p. 1. Retrieved 23 September 2017. Speakers of Tunisian and Libyan Arabic are able to understand about 40% of what is said to them in Maltese. ^ “Mutual Intelligibility of Spoken Maltese, Libyan Arabic and Tunisian Arabic Functionally Tested: A Pilot Study”. p. 1. Retrieved 23 September 2017. In comparison, speakers of Libyan Arabic and speakers of Tunisian Arabic understand about two-thirds of what is being said to them. ^ Watson, Janet (2002). The Phonology and Morphology of Arabic (PDF). New York: Oxford University Press. p. 13. Archived from the original (PDF) on 1 March 2016. ^ Al-Jallad, Ahmad (2015). An Outline of the Grammar of the Safaitic Inscriptions. Brill. p. 48. ISBN 978-90-04-28982-6. ^ Rydin, Karin C. (2005). A reference grammar of Modern Standard Arabic. New York: Cambridge University Press. ^ Osborn, J.R. (2009). “Narratives of Arabic Script: Calligraphic Design and Modern Spaces”. Design and Culture. 1 (3). ^ Quesada, Thomas C. Arabic Keyboard (Atlanta ed.). Madisonville: Peter Jones. p. 49. Archived from the original on 27 September 2007. Retrieved 11 October 2012. ^ “Reviews of Language Courses”. Lang1234. Retrieved 12 September 2012. Suileman, Yasir. Arabic, Self and Identity: A Study in Conflict and Displacement. Oxford University Press, 2011. ISBN 0-19-974701-6, 978-0-19-974701-6. Thelwall, Robin (2003). “Arabic”. Handbook of the International Phonetic Association a guide to the use of the international phonetic alphabet. Cambridge: Cambridge University Press. ISBN 978-0-521-63751-0. Jastrow, Morris (1905). “Arabic Language and Literature” . New International Encyclopedia.